Not only am I still working as a full time private chef for a family in New York City, but 2 weeks ago, my husband and I moved apartments. This is not only exciting because the new apartment is amazing and beautiful, but the kitchen……oh the kitchen…it’s the perfect space for me to create and cook and I couldn’t be happier. So I have been slowly breaking in the new kitchen with some old classic favorites like my Steakhouse Style Porterhouse, and my Whole Roasted Chicken, but last night I felt like doing a riff on an old classic…. I have posted a recipe before for Chicken Ballotine stuffed with my Mom’s homemade Thanksgiving stuffing, here and have decided to revisit the idea of the Ballotine with a new twist. I really enjoy the act of creating a Ballotine, which is the act of de-boning a whole chicken so that all you’re left with is a boneless whole carcass of chicken (it tastes better than it sounds). 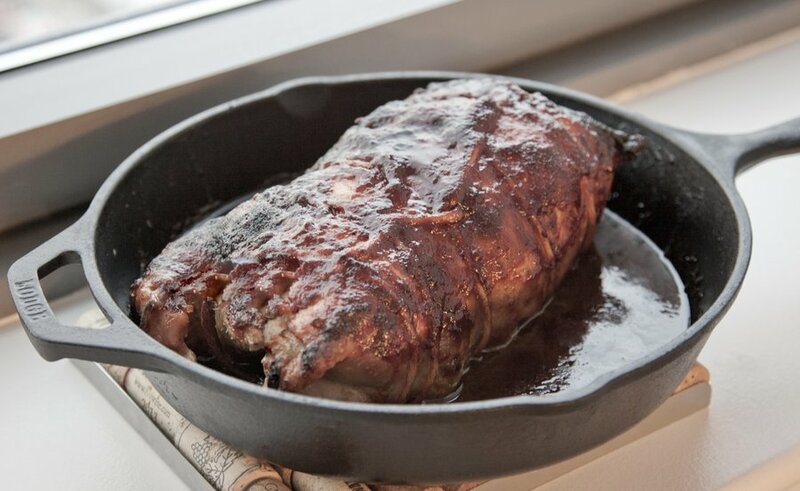 There’s so much you can do with it – you can stuff it with various ingredients, or marinate the inside with a marinade so that the inside of your meat is seasoned as well as the outside – or you can roast it plain and have this great piece of boneless meat which you can carve into easily. I have been craving BBQ lately so, on my day off, I decided to make a BBQ Chicken Ballotine. 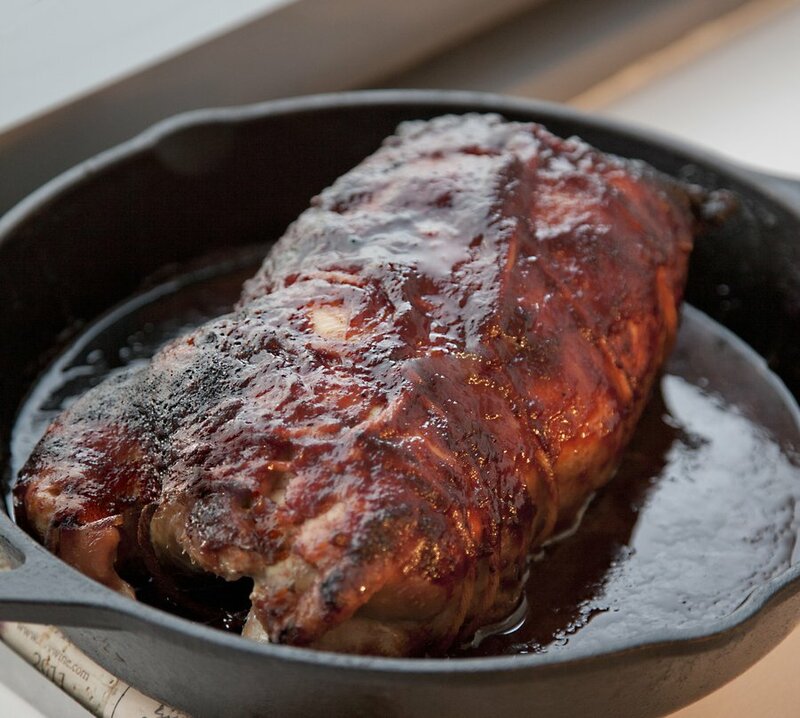 I have come up with this great recipe for BBQ Sauce (posted below), so I made that for this dish! Feel free to use your favorite store bought Sauce, but I encourage you to try this recipe – it has a great combo of savory, sweet and smokey….the three flavors I think are essential for a good BBQ sauce. 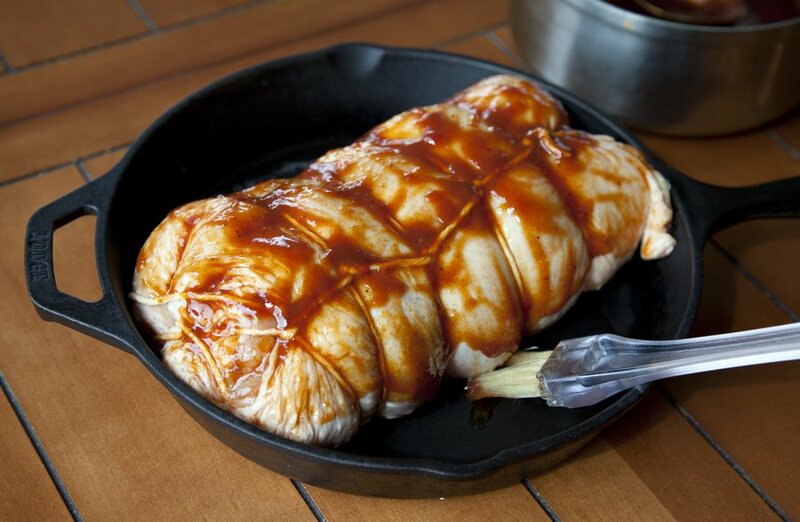 Or if you're not into the idea of a Ballotine, just make my BBQ Sauce and use it on anything and everything! Now for the intricacies of the Art of the Ballotine…. My go-to guide is this amazing video of Chef Jaques Pepin creating a Ballotine posted here. This will teach you all you need to know about de-boning a whole chicken. And for the art of tying up a chicken correctly for the best Ballotine check out my previous post here. 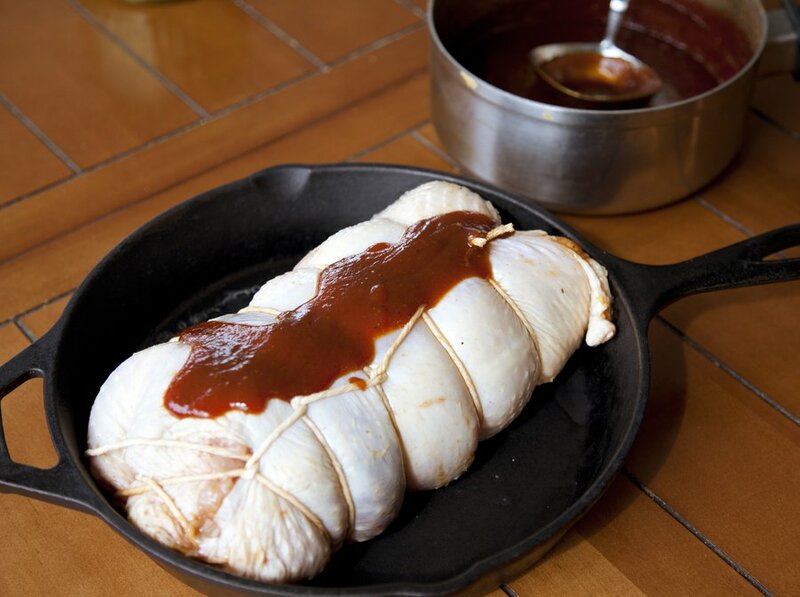 Instead of stuffing the chicken like I did in that post, my recipe below will have you coat the inside of the chicken with the homemade bbq sauce, and then tie up the chicken. This is not only a delicious recipe but it’s impressive to serve to guests! De-bone a whole chicken (see link above). Lay the chicken open with the meat side up. 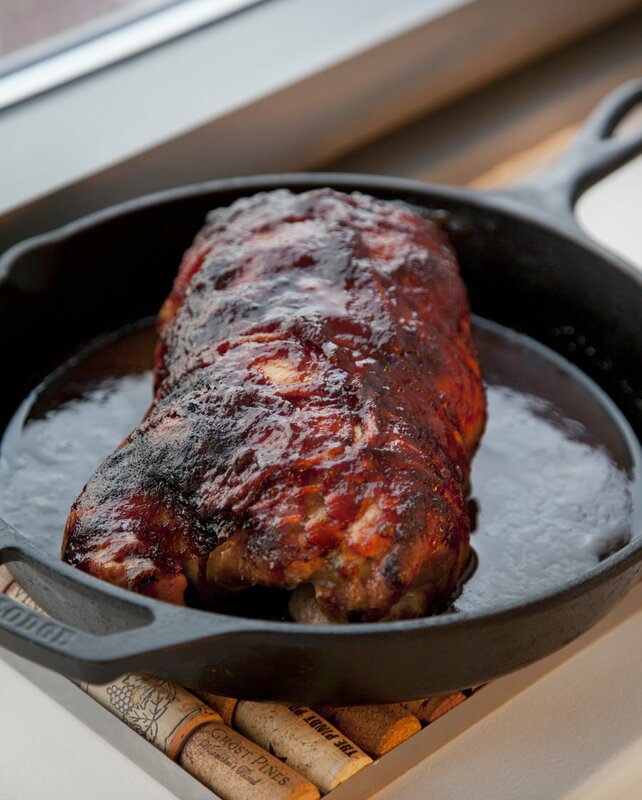 Ladle out a few ladles of your bbq sauce onto the meat side of the chicken and rub around. Sprinkle a little salt all over the meat. Preheat your oven to 400 degrees. 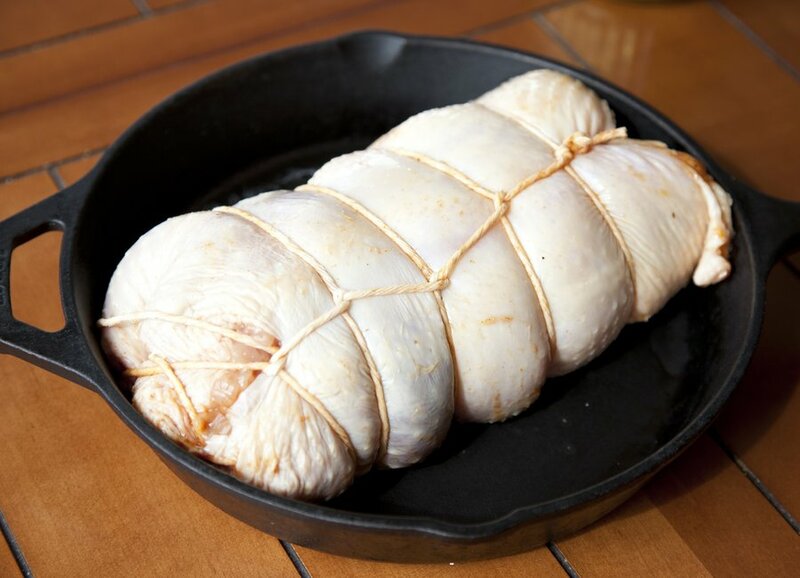 Tie up the chicken ballotine with butcher's twine (see link above) and place in a roasting pan. Ladle another ladle of bbq sauce on to the skin and rub around. Season the outside of the chicken with salt and pepper. Place the chicken in the oven and bake for 1.5 hours or until the internal temperature reaches 165 degrees (basting with more BBQ sauce every 20 minutes). Let the chicken rest 15 minutes before carving. Serve with extra bbq sauce on the side. 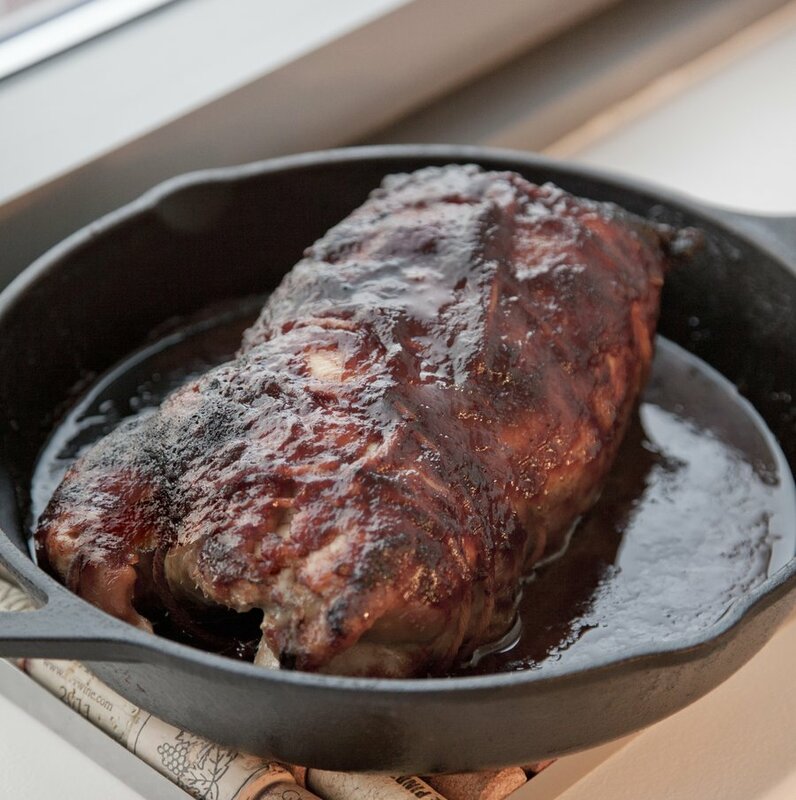 The perfect blend of Sweet, Tangy and Spicy - this BBQ Sauce is perfect on ribs! 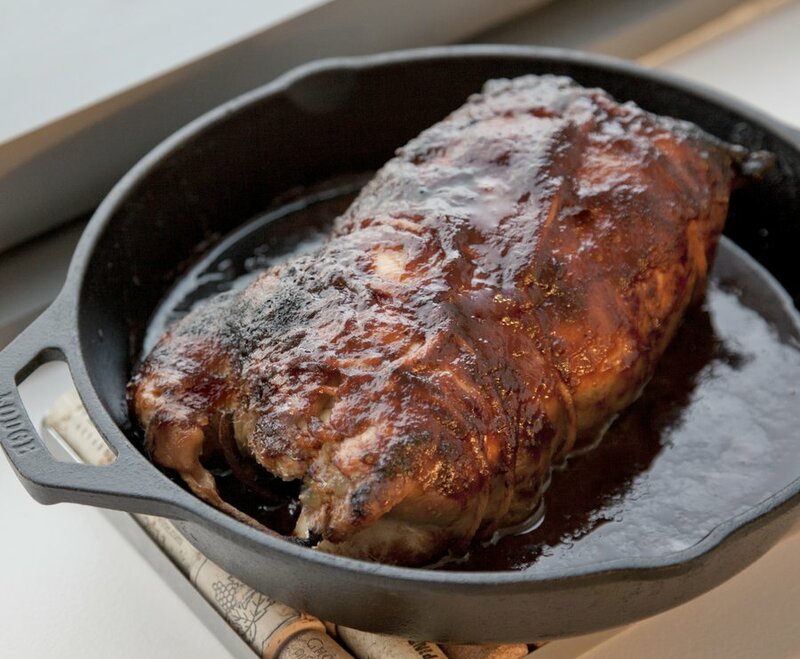 In a sauce pot combine your vinegar, liquid smoke, water, honey, corn syrup, ketchup and brown sugar. Over a medium heat stir to combine all ingredients. At this point, add in your garlic powder, onion powder, dijon, chili powder, pepper and salt and stir. Cook for at least 10 minutes stirring often. Now you need to taste it — I added some more salt and actually a little bit of Cayenne to give it a little kick. You want to cook it to the point where the vinegar isn’t super noticeable. Once you have it where you want it - let it cool overnight - the melding of the flavors really comes together when you let it rest and develop!